strategic planning so you get real value, actionable insights and regulatory respect. We customize the analytics for each bank, marrying a top-down approach with bottom-up data that focuses on the core fundamentals of banking. You see what you get. There is no black box you don’t understand. Our process is designed to provide management with full ownership and confidence in the analysis, without wasting their time. Stress testing is the tool, not the job. We stress test the bank’s strategic plan, its policy limits, where it stands today and where it may be two years down the road. We show you the capital impact of every contemplated action. We are not software vendors who give you a report and walk away. We provide expertise and leadership to the process, advising CEOs and boards on how to translate the analysis into actions that will increase profitability and shareholder value. When our bank clients understand the strategic value they can get from the process, they view stress testing as an essential part of their management toolkit, not a regulatory expectation. This is what regulators want. It’s the ultimate secret when it comes to regulatory blessings for your strategic plans. 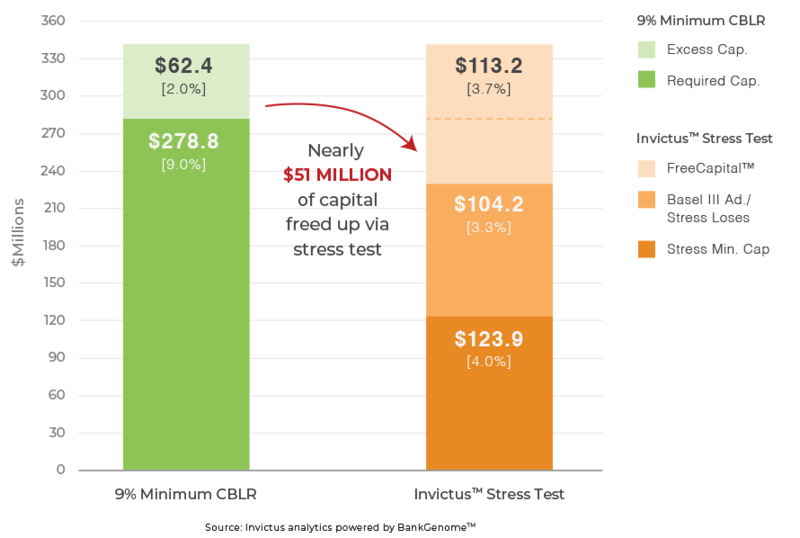 The Invictus Stress Test provides a competitive advantage by quantifying how much capital a bank would need to withstand a severe economic recession, usually less than the regulatory “rule of thumb” requirement. All community banks should conduct a stress test before opting in to the new Community Bank Leverage Ratio framework, which will require a leverage ratio of more than 9 percent. Note: FreeCapital™ is a trademarked calculation defined as reported capital less base capital less capital required for stress test. WE ARE THE PREMIER PROVIDER OF CAPITAL STRESS TESTING SOLUTIONS TO COMMUNITY BANKS. AND WE GET RESULTS. WE HELP YOU SET YOUR BANK’S DIRECTION. Our analytical techniques are validated through the key principles underlying CECL. That’s because our disruptive intelligence led us to develop our technology years before CECL was finalized. We are the only firm that can provide banks with both a stress testing and CECL solution using the same system, which is critical to doing it right.